She had just graduated and moved to Alaska for her very first job. Part of the gig was going to the docks, which is when she spied this handsome guy throwing lines to tie up their boat. That cute guy, Jeff, was working there as an engineer and they happened to have a mutual friend who happily introduced them. As the season grew to a close they knew there was something special between them so she agreed to go with him to Portland, the place where their love story really grew! What started as a hobby became a true passion as Cathy & Sunny took up biking together. So much so, that on a 2-day race to Portland he hid a ring in his backpack (added with a touch of anxiety over losing said backpack for a few hours) and revealed it to her as they crossed the finish line surrounded by family and friends. 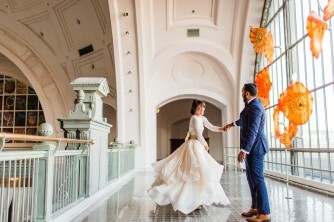 Her resounding YES lead to a beautiful wedding on the waterfront at the Woodmark Hotel. The games happened before their first look, which included a taste test, questions about Cathy (and push-ups), plus a karaoke rendition of Back Street Boys “I want it that way”. When you make your first date plans for brunch and the date ends up lasting 5 hours you know something magical has happened. That’s what Shea felt, after her cheeks hurt from smiling the entire date! They made plans immediately for a second date and were engaged 3 months to the date after they met, how romantic! 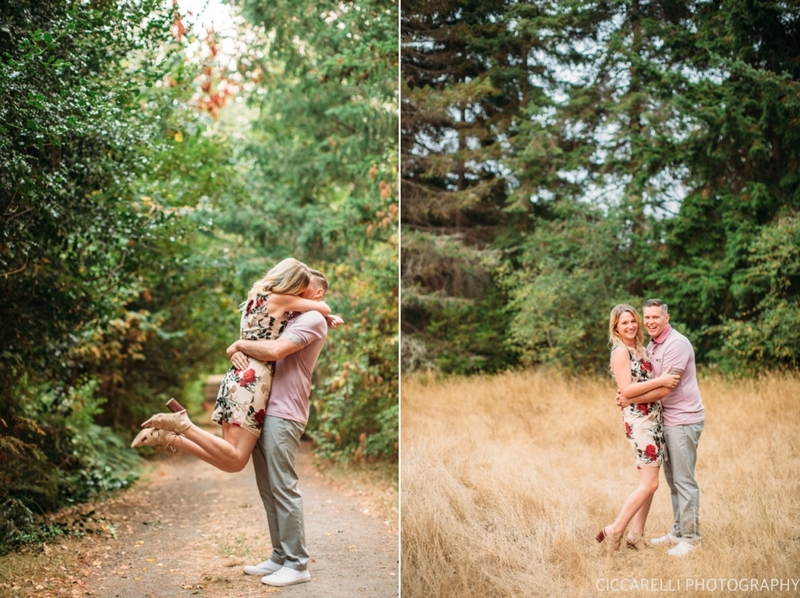 Shaun had planned on a sweet proposal in their favorite park down the street (hence why we shot their engagement session at Volunteer Park), but the rain didn’t let up that day so he switched plans and asked for Shea’s hand in marriage right in their living room. That apartment held so much meaning to them- where they met, fell in love and got engaged that we had to finish their session off right there, pups included. Photos happened just in time too since they were moving into their new home that same weekend! Their day was perfect. It started off with a relaxed morning, just the two of them, as they prepared to marry the love of their life, each other. A hop and a skip later they were in the garden, where they’d walked many times together before, but this walk would be special. It was a short stroll towards one another, at the same moment, holding onto their parents elbows, meeting in the middle. As guests listened to their promises, flowers swayed in the wind, birds chirped overhead and a fountain quietly gurgled nearby. It was the most perfect setting to promise their hearts forever. The day was hardly finished after their rose garden ceremony because just around the corner a surprise guest was waiting for their party near the reception. An owl greeted guests into the zoo, closed for their private event, and even the penguins celebrated with flips as Matthew & Daniel strolled by on their way to celebrate. An epic dance party ensued, with nearly every guest making a strong appearance on the dance floor. Daniel & Matthew were all smiles as they danced the night away, the first of many days they’d spend as husbands. The day had finally arrived! It all started with a sunset walk on a visit to campus, where they’d met. Joe made reservations at their favorite restaurant, the spot of their very first date. 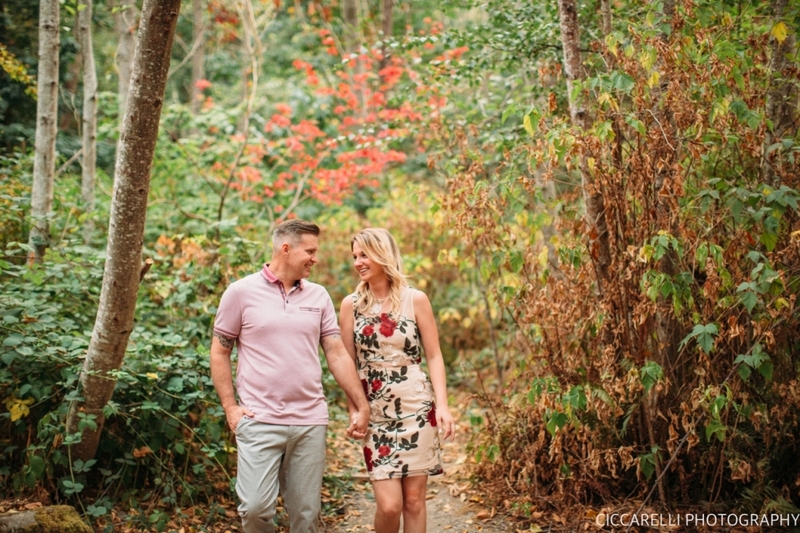 As they walked and reminisced before dinner he popped the question to her resounding YES! 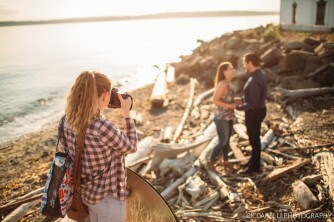 They made plans to marry in Seattle and wanted a place that seemed very PNW for all their out of town guests. Salish Lodge was the perfect match and they were blessed with blue skies and roaring falls. That morning as Katie read her many-page note from him, she had happy tears in her eyes, which only made her smile even brighter as she walked in her lace-up heels (perfectly fitted for a dancer of course) to meet him. He waited until the church to secretly read his note so that he wouldn’t be emotional for photos (but we caught him anyway), and was ear to ear smiling as Katie met him at the end of the aisle. We’d be remiss if we didn’t tell you that they had the most amazing first dance, but we expected nothing less from a dancer!